Just this weekend, Sally spotted my video of Van Halen's concert on my media cart. I had to admit it, and proudly, that I am a Van Halen fan. You think I go overboard for opera and Broadway? My friends, it all started long ago in a land far, far away. Coincidentally, yesterday my college roommate Robin sent me the link for a very sad story about this summer's botched reunion of the original Van Halen. It is sad for a number of reasons. It also makes me feel a little old and a little nostalgic all at once. I spent the summer of 1984 babysitting and watching MTV. The video of Jump from the album 1984 must have been played about 100 times everyday. I promptly fell in love with Eddie Van Halen. 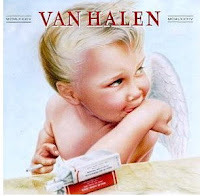 My employer, who was probably younger than I am now, had all of Van Halen's albums - yes, on vinyl! So when the video wasn't on MTV, I muted the tv and listened to the albums. It was my Van Halen summer. Oh, don't worry about the kids, they didn't really need a babysitter just a referee (ugh, those kids are married with their own children now). Anyway, that summer began my love affair with Van Halen and hair bands. Sammy Hagar's VOA was also released that year. Yes, I fell in love with Sammy too. My parents let me go to my first concert in Odessa! My friend Julie and I loaded up with Craig in his parent's truck and we drove the 40 miles to the Odessa Colliseum to see Sammy Hagar. There was still festival seating in those days. Oh what a thrill! The music was so loud! I'll never forget the feeling. Some years later, Robin and some other girls from our dorm loaded into my mom's Buick and drove from San Angelo to Austin on a week night to see Van Halen (now Van Hagar - yes! Sammy and Eddie on the same stage) play at the Erwin Center. We drove back to San Angelo after the concert. There was extra thrill that night since we all were getting away with a little naughtiness - driving four hours in the middle of the night without any of our parents knowing where we were. Rock-n-roll and independence. A few years later Robin and I made roadtrips across Texas for Van Halen again (still Van Hagar). We saw them in Austin and Houston over the same weekend. There's nothing like burning up the Texas highways for love of rock-n-roll. And if this Van Halen reunion had taken place? Yes, we would be there. I always knew that, deep down, you'd turn out to be a Van Halen girl. What? No mention of David Lee Roth?